Powerful mac flac file converter. 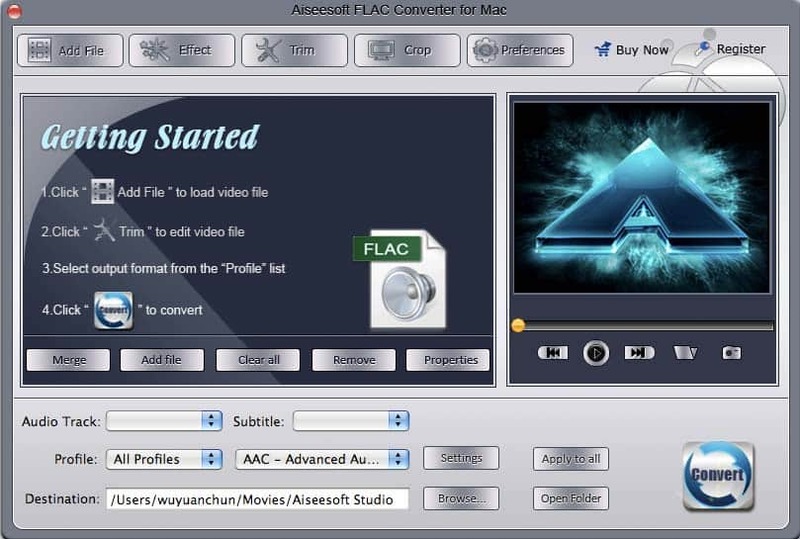 Aiseesoft FLAC Converter for Mac is the powerful mac flac file converter that can help you to convert any audio file formats like AAC, AC3, AIFF, AMR, AU, FLAC, MP3, M4A, MP2, OGG, WAV, WMA to FLAC. This professional audio converter can also extract audio from video files including MPG, MPEG, MPEG2, MOV, QT, MP4, M4V, RM, RMVB, WMV, ASF, MKV, TS, MPV, AVI, 3GP, 3G2, FLV, MPV, MOD, TOD, etc and convert them to FLAC. Moreover, this FLAC Converter for Mac can also convert between any formats of audio files. Apart from the basic converting function, Aiseesoft FLAC Converter for Mac provides you more editing functions, which could join several files into one file, capture any clip of audio or split audio to several audios, select audio track and so on. More specific output parameters are available for you to get the exact that you need. Aiseesoft FLAC Converter for Mac is also the audio editor, which could merge several audios into one file, trimming any clip of audio or split audio to several audios. With this FLAC Converter, you can capture the screenshot of the playing movie in the preview window, and saved it as JPEG, GIF or BMP formats. Aiseesoft FLAC Converter for Mac allows you to convert one file to several audio formats at the same time. Powerful FLAC to MP3 Audio Converter for mac. Convert among all popular audio files. Convert audios to WMA/MP3 audio formats.